SACRAMENTO, Calif. – At the stroke of midnight Nov. 8, recreational use of marijuana became legal in California – but there are a few important details about the new law 7. It now is legal for adults age 21 and older to possess up to one ounce of marijuana or eight grams of concentrated cannabis for personal use. People can carry that amount around, but if they’re in a car it must be in a locked container. Dale Gieringer, director of the California chapter of the National Organization for Reforming Marijuana Laws (NORML), said there are limits on how much people are allowed to grow. Use of medical marijuana continues as before. Retail sales of recreational marijuana won’t be allowed until state-licensed businesses open their doors in January 2018. 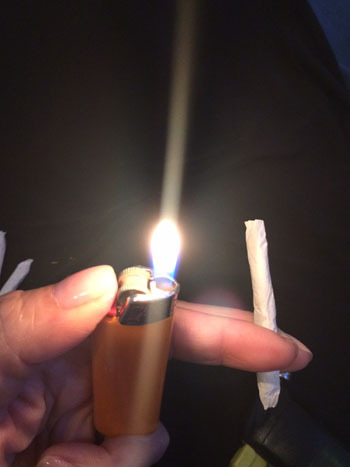 Gieringer said it’s important to note that lighting up in public is still a no-no. It also is illegal to smoke or vaporize marijuana at or within 1,000 feet of a daycare or school, except in a private residence that happens to be near those types of facilities. More information about Proposition 64 from the California Secretary of State’s office is online at voterguide.sos.ca.gov. The recreational use of marijuana and hemp would become legal, with sales taxes imposed upon them, under an initiative going before California voters on Nov. 8. Proposition 64 would also establish packaging, labeling, advertising and marketing standards and restrictions for marijuana products, including prohibiting marketing and advertising marijuana to minors. The initiative also authorizes re-sentencing and destruction of records for prior marijuana convictions. Passage of the initiative would result in net reduced costs ranging from tens of millions of dollars to potentially exceeding $100 million annually to state and local governments related to enforcing certain marijuana-related offenses, handling the related criminal cases in the court system and incarcerating and supervising certain marijuana offenders, according to an analysis conducted by the Legislative Analyst’s Office and Department of Finance. The analysis also found passage would result in net additional state and local tax revenues potentially ranging from the high hundreds of millions of dollars to more than $1 billion annually related to the production and sale of marijuana. Most of these funds would be required to be spent for specific purposes such as substance use disorder education, prevention and treatment. Opponents — including Sen. Dianne Feinstein, D-Calif. — argue that legalizing marijuana will lead to a sharp increase highway fatalities and impaired driving, noting there is no current standard for determining if a driver is “impaired” by marijuana. They also argue the measure would permit marijuana farms near schools and public parks and will lead to a proliferation of “pot shops,” particularly in inner-city communities. Detractors also contend the measure would allow prime-time television advertisements for marijuana, exposing children to the drug. Backers of the measure flatly deny that the proposition includes any such provision and includes strict requirements to prevent marketing or sale of marijuana to children. “It’s just a plant” is a common refrain from those who want to legalize the leaf, but a recent study of cannabis production argues that the environmental impact of marijuana farming must be considered — especially as more states move toward further legalization this election season. The study was conducted by Jake Brenner, an assistant professor in the Department of Environmental Studies and Sciences at Ithaca College, and Van Bustic, a specialist at the University of California Cooperative Extension. It was published earlier this year in the journal Environmental Research Letters. The study also highlights the lack of published, peer-reviewed empirical research on all aspects of cannabis agriculture, which is already a multi-billion dollar industry in the United States despite still being listed as a Schedule 1 drug by the federal government. 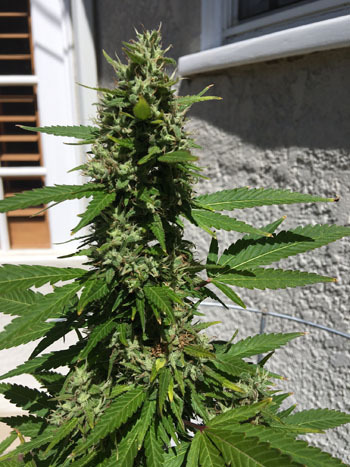 The amount of land and water used for growing cannabis has not traditionally been a concern, especially when compared to other agricultural products grown in California. But where the cannabis is grown has potential ecological consequences. Brenner and Bustic examined grow sites in three northern California counties and found that their usual placement had potentially negative impacts on two threatened fish species. 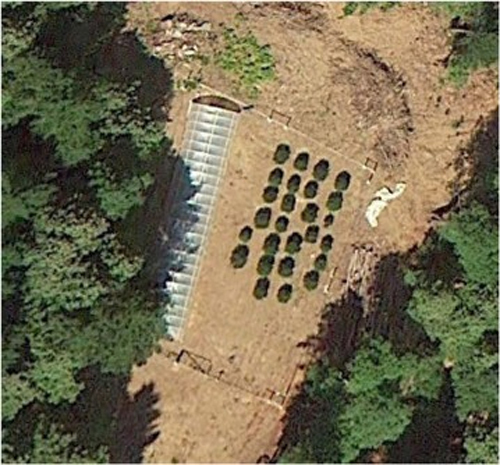 Aerial view of marijuana plants and cannabis agriculture. That’s because the sites are typically placed on remote plots of land in forested areas, many on steep slopes. Access roads need to be created and swaths of land cleared for production, regardless of whether the cannabis is grown outdoors or in a greenhouse; that increases potential for soil erosion and chemical run-off into streams in which the Chinook salmon and steelhead trout live. 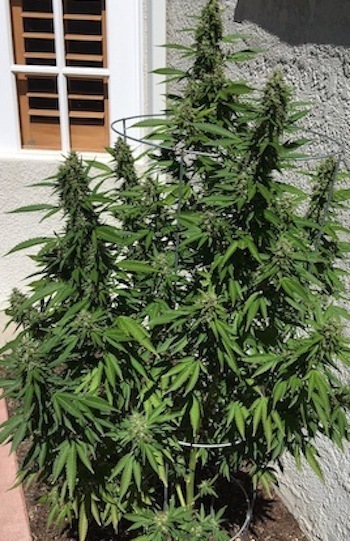 The fish are also susceptible to harm from a decrease in water flow as a result of the cannabis agriculture. Brenner and Bustic say their study, which covers the watersheds of northern California’s Humbolt County, is an example of the sort of survey and analysis that could be done — and is necessary — anywhere cannabis agriculture takes place. And while California is taking efforts to encourage local governments to create land-use policies for cannabis agriculture, they argue that more research on marijuana farming needs to be done.“Land-use science on cannabis agriculture lags behind research on other crops, but advances in the field will be crucial for predicting future cannabis expansion and moderating its impacts,” they write. That multi-billion marijuana production industry is only going to grow: This November, voters in Arizona, California, Maine, Massachusetts and Nevada will decide whether to allow their states to legalize and tax recreational marijuana; while voters in Arkansas, Florida, Montana and North Dakota will head to the polls to determine whether their states will allow medicinal uses of marijuana, joining the 25 other states that already do so.